OMG! I have a tick! The romance is over. The Highlands is not for us. I have a tick, no, a pair of ticks on my head! This must have been from frolicking in the “wilderness” of the Highlands. And as for Mummy, she has about 30 midges bites! 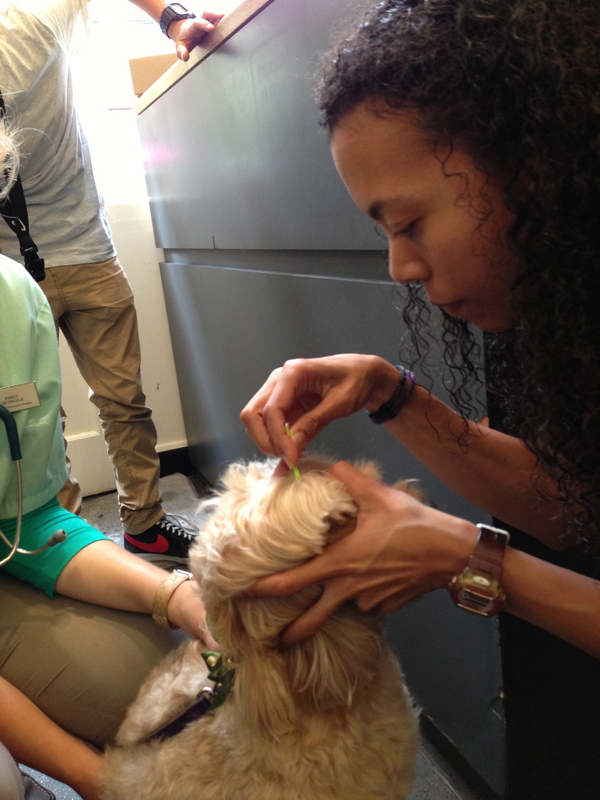 We only found out about my tick because I went to have a de-matting session at The Pet Spa. 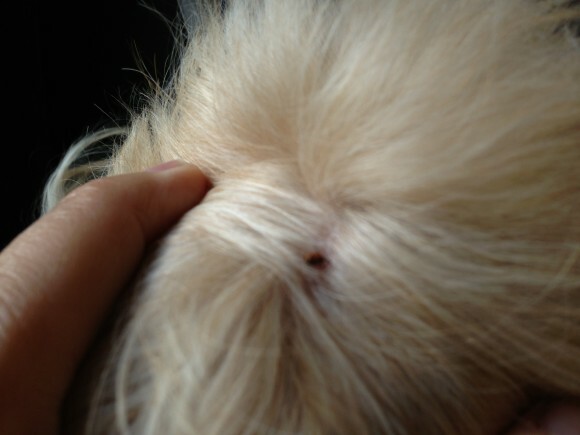 When they told Mummy I had a tick on my head – she was in disbelief. I think she was amiss with the Frontline – a month overdue I think she said. Tsk! Tsk! 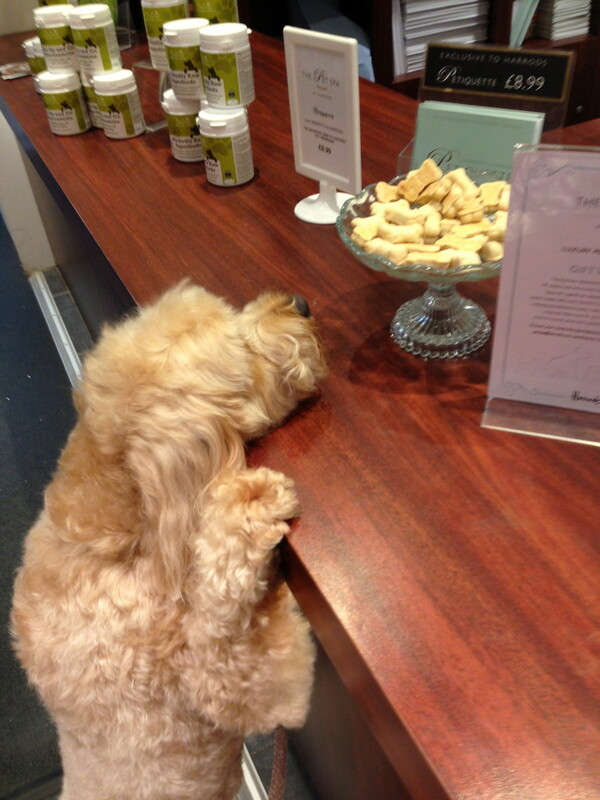 I was happily trying to get at the treats at the Pet Spa – unbeknownst to me that I have a tick on my head! So we rushed off to our vet – Kynance Vet who kindly and gently removed what we thought was one tick but it turned out they were a pair – having a jolly on my head! Nurse “Hathaway” removing my ticks. I was very good – I stayed still and let her get on with it. May’s comment: Wikipedia’s definition of: “the Highland midge is a species of small flying insect, found in upland and lowland areas (fens, bogs and marshes) especially in the north west of Scotland from late spring to late summer.” They are a pest alright! As for being amiss on the Frontline – lesson learnt – never do that again. I think because it had been so cold, I forget that it could happen. For a change we’re trying advantix (R) for the summer. 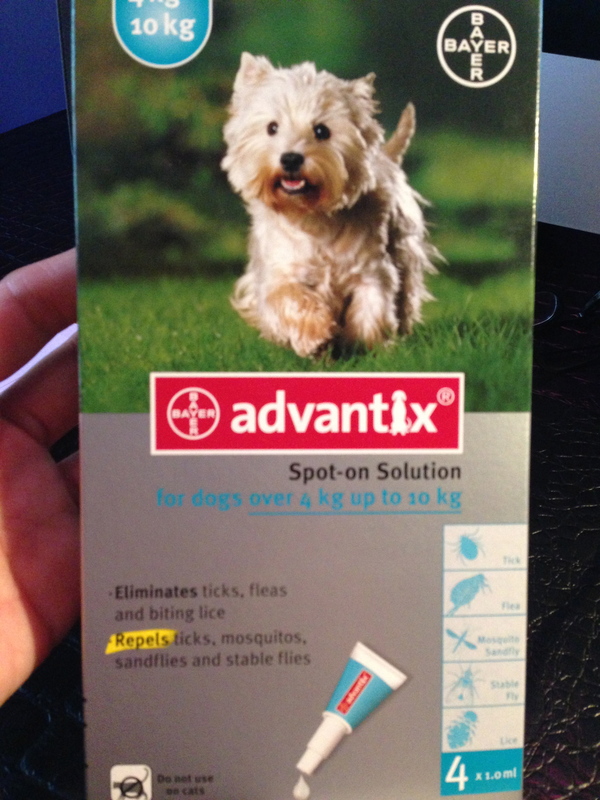 It is supposedly better for ticks – especially when she’s leaving for Suffolk again in a couple of days.